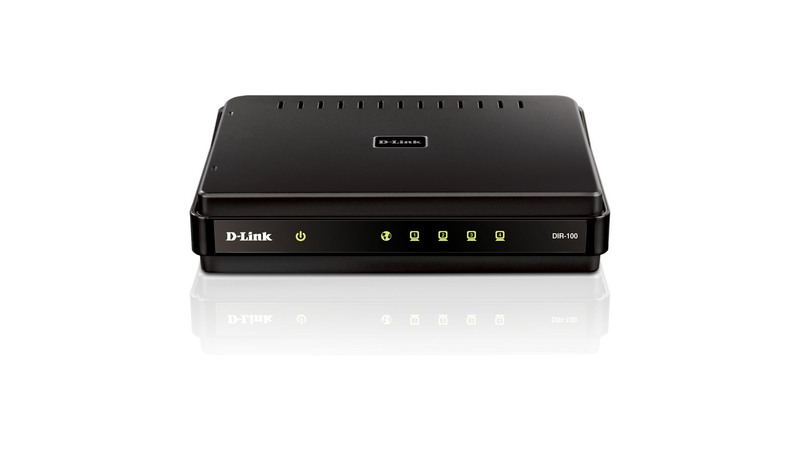 Connect the D-Link DIR-100 router to your cable or DSL modem and share your high-speed Internet connection with multiple computers in your home. This router creates a high-speed and completely secure network to share photos, files, music, video, and storage. Get a better Internet experience and extend your network coverage with the D-Link DIR-100 router. The DIR-100 is designed for easy and robust connectivity among heterogeneous standards-based network devices. Computers can communicate directly with this router for automatic opening and closing of UDP/TCP ports to take full advantage of the security provided without sacrificing functionality of on-line applications. The DIR-100 provides prioritized transmission and reception of VoIP and on-line packets to/from the Internet to enable a group of users to experience the benefit of smooth network connection of inbound and outbound data without concern of traffic congestion. This QoS support allows users to enjoy high broadband transmission for applications such as Internet phones, multimedia and games over the Internet. The DIR-100 router provides firewall protection for network computers again Internet DoS and virus attacks. It filters packets to screen access control based on port and source/destination MAC/IP addresses. With Virtual Server Mapping, the router can be set up to allow separate FTP and multiple games to share the same Internet-visible IP address while still protecting servers and workstations from hackers. Users can set up a home or office web site by configuring any of the built-in LAN ports to function as a DMZ port. Parental control allows parents and network administrators to filter out undesired URL web sites, block domains and control the time of day of the use of Internet through scheduling.